The silt striders appreciate it. After writing about the latest update for the excellent Morrowind: Rebirth mod yesterday, the allure of the best Elder Scrolls game was strong. But I can’t just reinstall Morrowind; at the very least I need to spend a couple of days finding more mods, like Morrowind Enhanced Textures. It might not have a flashy name, but it sure is pretty. HD texture mods often look strange and out of place, especially in older games like Morrowind, but this appears to be one of the exceptions. Don’t expect it to suddenly look as good as new, but there are places where it looks not far off Skyrim. The character models still look goofy as heck, but that’s The Elder Scrolls for you. The technique used to enhance the textures is called Enhanced Super-Resolution Generative Adversarial Networks (ESRGAN), and gosh people need to do a better job of naming things. It’s an AI upscaling method that generates realistic textures without the artifacts that you get from plain old Super-Resolution Generative Adversarial Networks. 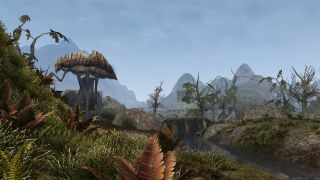 Modder DassiD says they made several passes with the tool and upscaled the textures by four times Morrowind’s original resolution. They’ve included some comparison screenshots on Nexus, where you can also download the mod. It looks impressive, though it’s worth noting that a few other mods have been used in the screenshots to make them look even lovelier.